Chloe's Way: SUPER LAST MINUTE GIFT IDEAS: LOOK FANTASTIC BENE-BARGAINS! SUPER LAST MINUTE GIFT IDEAS: LOOK FANTASTIC BENE-BARGAINS! Hi lovelies! Another Benefit Cosmetics centred post today - can you tell I'm obsessed?! I just had to share this though, as I couldn't get over the incredible deal! I had a sneaky little peek on Look Fantastic this morning and not only was I greeted with a banner offering FREE UK Next Day Delivery (perfect for Christmas Eve, Eve!) guaranteeing delivery in time for Christmas, but I also found these Benefit gift sets for a huge third off! The Beauty Bon Bons set is worth £64.52 and is now down to just £26.33! This includes a full sized Highbeam, full size Hoola Bronzer and Deluxe miniatures of the Hoola Lipgloss, PoreFessional and They're Real Mascara. This is perfect for someone who loves Benefit already, or someone new to it, as it's a great way to try all these products. 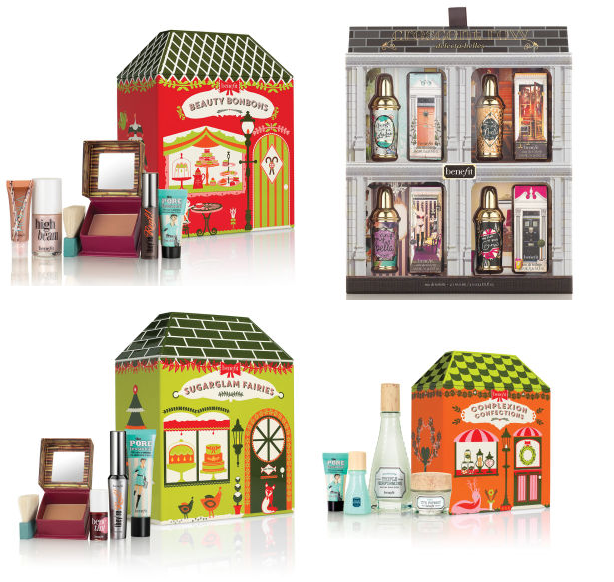 The Crescent Row Delecta-Belles set includes four 10ml perfumes and is worth £39.33 and is now only £19.66. Each perfume comes in a cute little gift box and is a perfect way to try them all out before you decide which one you want to buy full sized. The SugarGlam Fairies set has a total value of £75.34 and is down to only £29.66 (I've actually just got my Mum to order this for me as she wanted to get me a little extra present! ), this includes a gull size of Hoola Bronzer, They're Real Mascara and PoreFessional with a Benetint deluxe mini. I think this is absolutely incredible for the price and would make an amazing present for anyone new to Benefit as it's got four cult favourites included for an incredibly low price! So that's it! Just a quick one as I wanted to let you all know now before the sell out or it's too late! Will you be picking up a Bene-Bargain today? All four of these Benefit Cosmetics packages look like superb gift ideas and would be delightful to receive. How perfect are those sets? Benefit have really outdone themselves this year!